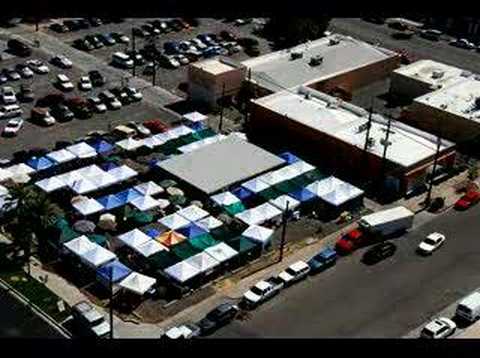 Welcome to the Downtown Phoenix Public Market, a program of Community Food Connections, a 501 c 3 non-profit organization. The Market marks the spot where community revitalization, economic development and a showcase for local small-scale agriculture and local artists and crafters intersect in the heart of the city. The market also accepts Food Stamps. One minute time-lapse of 8 hours (5:30AM-1:30PM, Saturday, June 7, 2008). Frames taken automatically at 30-second intervals with Nikon D200 from the top of Westward Ho. Played back at 15 frames per second in QuickTime Pro. Jennifer W dez 2008 "Fostered a connection between the Downtown Public Market and the Phoenix Permaculture Guild. Thanks to this collaboration, the PPG taught 180 "green living" classes at the market in 2008."